Tagline: Choose life. Choose a job. Choose a starter home. Choose dental insurance, leisure wear and matching luggage. Choose your future. The Story: With its hallucinatory visions of crawling dead babies and a grungy plunge into the filthiest toilet in Scotland, you might not think Trainspotting could have been one of the best movies of 1996, but Danny Boyle's film about unrepentant heroin addicts in Edinburgh is all that and more. Trainspottings blend of hyperkinetic humor and real-life horror is constantly fascinating, and the entire cast (led by Ewan McGregor and Full Monty star Robert Carlyle) bursts off of the screen in a supernova of outrageous energy. 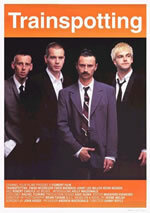 Adapted by John Hodge from the acclaimed novel by Irving Welsh, the film was a phenomenal hit in England, Scotland, and (to a lesser extent) the U.S. For all of its comedic vitality and invigorating filmmaking, Trainspotting is no ode to heroin, nor is it a straight-laced cautionary tale. Trainspotting is just a very honest and well-made film about the nature of addiction, and it doesn't pull any punches when it is time to show the alternating pleasure and pain of substance abuse.